Did you know that the city of Barcelona was enclosed by Medieval city walls until 1854? And that the neighborhood of the Eixample, home to the U232 Hotel, constitutes one of the city’s most characteristic images, with its rows of perfectly laid octagonal blocks? From the sublime order of the Eixample, planned by architect Ildefons Cerdà, we travel down the hill towards the Raval, which leads us to the epicenter for contemporary art in the city enter: MACBA, the Museum of Contemporary Art of Barcelona, and a symbol of the ongoing transformation of an entire city district. We’ll leave the modern art world momentarily to pass some fixtures of Medieval architecture, the Library of Catalonia and the Santa Creu Hospital, separated only by a tranquil patio where we can rest briefly and regain strength for crossing the well-loved Ramblas, and weaving into the heart of the Gothic Neighborhood, entering at the Plaça del Pi. Running up Call Judío, we then make our way across Plaça Sant Jaume, the city’s governmental center; on our left we see the headquarters of the Catalan Regional Government, and on our right sits the City Hall of Barcelona. From here the route diverges towards the Cathedral, passing on the way the lovely Plaça del Rei, a small gem within this bustling city center, and finally arriving at the renovated Santa Caterina market, a public market known for its spectacular, colorful and wavy roof. Here we can take a break for a snack or buy some fresh fruit. For lovers of Catalan modernism, this running tour has something particularly special in store: on our route, and almost on a whim, we will find ourselves before the Catalan Musical Palace, the work of Lluís Domènech i Montaner. If you think the outside is spectacular, you can’t even imagine what awaits you inside! After crossing the Plaça de Catalunya, we’ll run up the Passeig de Gràcia, the true epicenter of the city, with its luxury shops and its structures holding so much cultural heritage. We’ll pass by the “Block of Discord,” the site of three of the movement’s most distinguished structures: Casa Lleó Morera, by architect Domènech i Montaner; Casa Ametller, the work of Josep Puig i Cadafalch; and what is perhaps Antoni Gaudí’s most famous work, Casa Batlló. If you look for this legend in Greek mythology, you’ll discover the most beautiful woman known to the ancient world; then you can decide which of these buildings is Barcelona’s finest! Following these miraculous sites we’ll have under two miles to run before returning to the hotel! 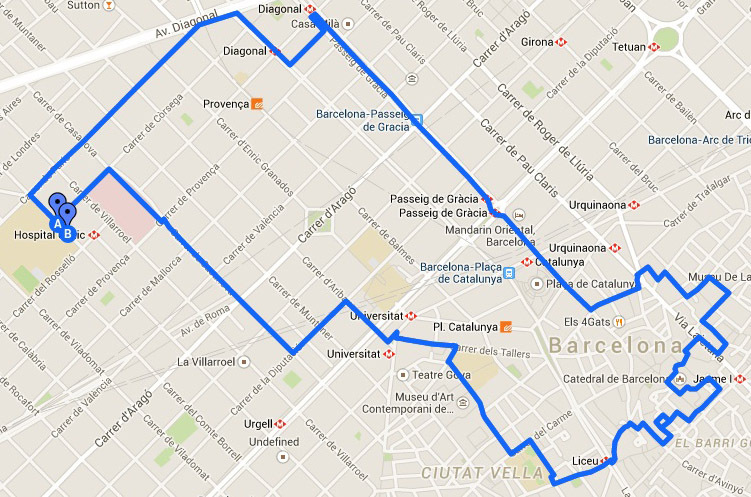 We’ll pass the spectacular Casa Milà, also known as the Pedrera, due to its sinuous façade; we’ll also run for a bit on the grand Avenida Diagonal, a characteristic thoroughfare on the city map. Once arrived at the hotel, we can observe the façade of the Industrial College, today the School of Technical and Industrial Engineering of the UPC, and the former headquarters of the textile plant of Can Batlló, a modernist complex perfectly prototypical of the technical and industrial development of Barcelona in the 19th century. In a typical “running tour”, as the global phenomenon is known, clients enjoy a private or group tour, led by a professional running tour guide who will bring you to those places of the city that often remain hidden to the general public. 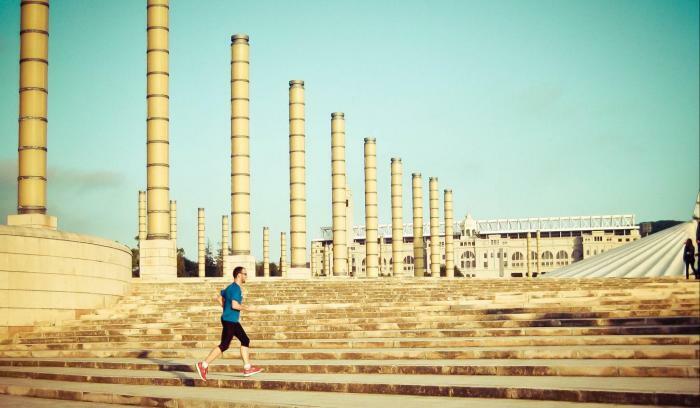 Running tours are for those who learn the streets by stepping on them. 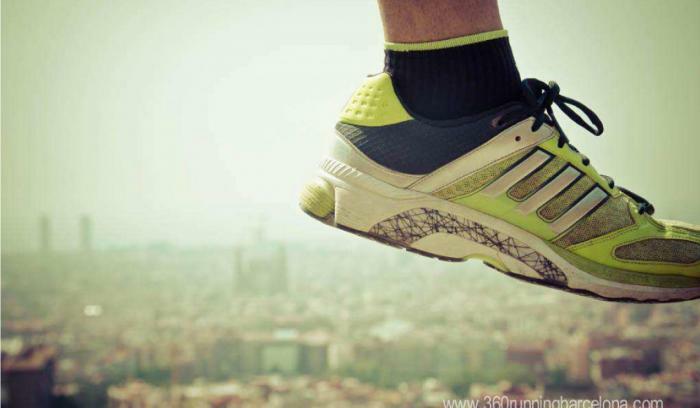 360º Running Barcelona is run by local guides, running enthusiasts who love to share their love for their home city, Barcelona. It doesn’t matter what kind of runner you are; if you’re a veteran marathon runner or accomplished in another sport, the key is to enjoy the experience. That’s why we adapt to the rhythms of the most accomplished runners, as well as to those who move at a slower pace, so that all can enjoy the experience of getting a new perspective on a foreign city.